In the first pAsuram, AzhwAr who is devoid of upAyams (means) such as karma yOgam etc and who is desirous of a saviour, sees emperumAn who is complete and is seeking those who seek his protection, and sets out to have his desire fulfilled. In the first pAsuram, AzhwAr says “I am devoid of upAyams mentioned in SAsthram to attain you, and cannot survive without you; am I outside the purview of you who are a favourer in being together with your devotees and who are ready to help others?”. endhAy – Oh benefactor for me! allEn – I am not. I have not performed karma yOgam to attain the result; I have not performed gyAna yOgam which is in subtle form and is focussed on knowledge about self and god; though not having bhakthi yOgam which is possible by having these two, i.e., karma yOgam and gyAna yOgam, I am unable to survive even for a moment without you after meditating upon your qualities; Oh benefactor for me who is seated in a distinguished manner manifesting your readiness to protect well your devotees in SrIvaramangala nagar [vAnamAmalai/thOthAdhri, also known as nAngunEri] where attractive lotus flower is blossoming while being mingled with paddy crop in muddy fields! In your presence there, I am not an outsider to the savable souls who are to be saved by you who are the saviour. nORRa nOnbilEn nuNNaRivilEn – AzhwAr is saying similar to what is said in sthOthra rathnam 22 “na dharma nishtOsmi na chAthmavEdhI na bhakthimAmsthvachcharaNAravindhE” [Though ALavandhAr appears after AzhwAr, here the commentator has stated that AzhwAr is stating similar to what is stated by ALavandhAr, to make us understand the similarity. In reality, ALavandhAr explained what is already explained by AzhwAr]. na dharma nishtOsmi – There are certain aspects which make people think “he is engaging in some pursuit on his own”, which in turn makes me bewildered thinking “we will attain something by this” and will lead you to give up on me [since you are the real means to attain you, you cannot tolerate any other means], but will not lead to the result [i.e., there is no guarantee that the result will be achieved by karma yOgam etc]. na cha Athma vEdhi – those who pursue gyAna yOgam will know about self – I don’t even have such knowledge. I don’t have knowledge about ISvara which is preceded by true knowledge about self as said in SrI vishNu purANam 6.5.57 “thath gyAnam agyAnam atha: anyath uktham” (Knowledge about bhagavAn is only identified as knowledge; everything else is ignorance only). na bhakthimAn – No need to separately say “I have no bhakthi” – only with karma yOgam and gyAna yOgam, bhakthi yOgam can be present. nORRa nOnbilEn – Is it not sufficient to say nOnbilEn [to indicate that he is not engaged in karma yOgam]? Should AzhwAr say nORRa nOnbilEn? This is to indicate “I do not have any karma yOgam, which is performed perfectly to lead to the desired result”. [was there any one who waited for results after engaging in karma yOgam] I do not have karma yOgam like that which was practiced by dhaSaratha chakravarthy or SrI vasudhEva which leads to the result. When asked, like those who do not have any principal will not get any interest, if these don’t exist how would you get the result? Agilum – Even if this is the case. Even if you [bhagavAn] considered “ARRagiRkinRilEn” as my upAyam (means), there is no meaning for my using the word “Agilum” [in spite of not having any means]. ini – Is it not appropriate for me to miss out on you when I did not know you and myself? But should I still miss out on you after knowing your completeness and my defects? When a person has food in his hands and is willing to share it with others, and another person is needing food and is hungry, should the hungry person miss out? ini – Am I having something in my hand and waiting for it to culminate in result? You may consider my saththai (that which sustains me) as upAyam (means) and discard me. Since time immemorial, I had forgotten my nature and lost the opportunity to serve you. Now that I have truly accepted your lordship, should I still miss out on the opportunity to serve you eternally? unnai vittu – If you too are [incomplete] like me, will I not be relaxed [and not think about attaining you immediately]? Are you such that, I have to do something to attain you? unnai vittu – How can the body sustain itself without the soul? onRum ARRagiRkinRilEn – The knowledge about you, is not letting me sustain myself. sIthAp pirAtti had a way to sustain herself saying as in SrI rAmAyaNam sundhara kANdam 39.30 “thathdhasya sadhruSam bhavEth” (SrI rAma saving me and accepting me will match his stature) and relax, but for AzhwAr, emperumAn need not build a bridge on the ocean and kill rAvaNa [so he must come immediately]. aravin aNai ammAnE – Until now, AzhwAr highlighted his own incompleteness; from now on, he is highlighting emperumAn’s completeness. aravin aNai – Can I be relaxed seeing your attachment towards bhOgam (bhOga means enjoyment as well as serpent)? While you are paramabhOgi (supreme enjoyer, supreme being on the serpent bed), can I be relaxed? ananthaSAyithvam (reclining on AdhiSEsha) is an indication of supremacy. Oh sarvESvara who is having serpent as your bed! sERRuth thAmarai … – I can be relaxed and be patient if you are simply reclining on AdhiSEshan. 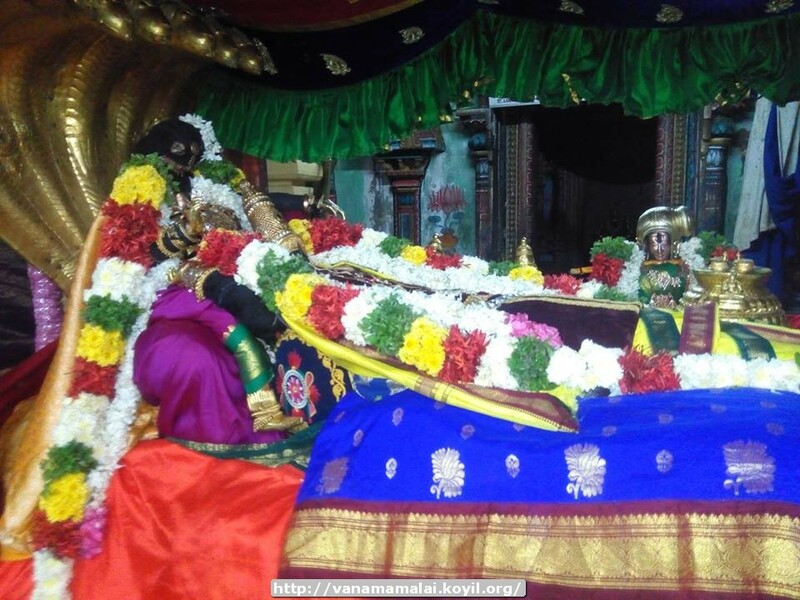 sERRuth thAmarai – The abode which will make one forget even paramapadham. In the muddy swamps, the lotus flowers standing close to the paddy crop, blossom appearing like umbrella to the crop. As the king descends to a place, his associates will follow [similarly, as emperumAn descended from paramapadham to SrIvaramangala nagar, nithyasUris too followed him and assumed various forms]. sirIvaramangala nagar – As said in “dhEvanAmbhU: ayOdhyA” (ayOdhyA [another name for paramapdham] is the abode of nithyasUris). emperumAn residing in this abode with more joy than in paramapadham. The abode where he permanently resides for the protection of the samsAris (worldly people). vIRRirundha – Instead of residing with disgust thinking “I who resided in that great paramapadham, have to reside here now”, residing joyfully in a distinguished manner as a prisoner who was crowned in a kingdom would be. endhAy – Just as his stay there is meant for the nithyasUris, the stay here is specifically meant for me. My father who is residing in sirIvaramangala nagar. unakku migai allEn – If you resided in the distant abode of paramapadham, I can be patient and sustain myself, but you have specifically descended here for me, and hence, how can I miss out on you any more? unakku migai allEn – As said in SrI rAmAyaNam ayOdhyA kANdam 31.32 “vaidharmyam nEhavidhyathE” (there is no unrighteousness in this), I am not here for anything else. When I am beyond your reach, I will cease to exist. angE – As said in “thavachArtha prakalpathE” (it is a gain for your highness only), the benefit is also for your highness only. As a nursing mother will be happy to see the satisfied face of a fully fed baby, the master will gain when the servitor realizes his true nature and engages in servitude. This entry was posted in thiruvAimozhi, thiruvAimozhi 5th centum on August 5, 2017 by Sarathy Thothathri.